Driver killed after pedestrian bridge collapsed on truck identified as 58-year-old Elchai Tederi of Holon. The driver tragically killed in Monday's Ramat Gan bridge collapse has been identified as Elchai Tederi, from Holon. 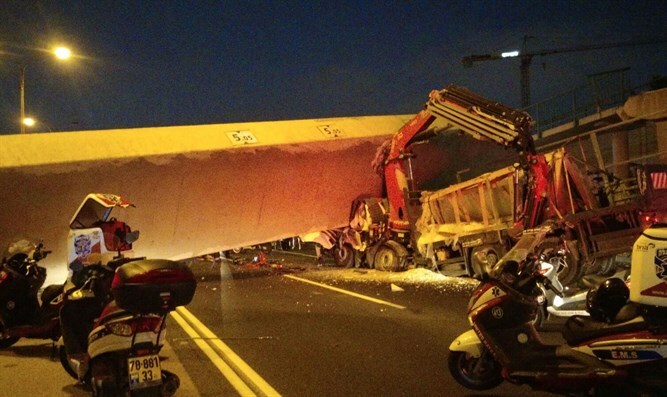 The 58-year-old was killed when a crane he was transporting suddenly opened while driving under a pedestrian bridge connecting the Bar Ilan University campus to Ramat Gan, causing the bridge to collapse on his truck. Rescue workers spent hours attempting to reach Tederi, but were unable to lift the heavy bridge that had crushed his truck. Earlier reports had spoken about another man trapped, but were dismissed as inaccurate after rescue forces finally managed to reach the driver. One policeman was lightly injured in the rescue effort. Netivei Israel announced that the bridge collapsed as a result of the severe damage caused by the truck's crane which was raised to a height that was above the permitted level . "An initial investigation of the incident determined that the severe damage was caused by the truck's crane and is responsible the downfall of the bridge," Israel's Infrastructure Authority Netivei Israel said in a statement.